Editorial: Will poor marketing doom Windows Phone? Home > Windows Phone > Editorial: Will poor marketing doom Windows Phone? 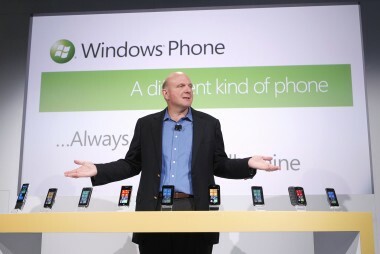 Next month, it will be a year since Steve Ballmer stood in front of a table of new Windows Phone 7 devices. Phones from HTC, Samsung, LG and Dell were all accounted for and would be released in the months to follow. To this day, you’d be hardpressed to pick a winner from that group, although most would likely say it’s the Samsung Focus. Campaigns for that phone were minimal and poor at best. For their part, Microsoft was fair in their presentation of the handsets, almost to a fault. The result was a group of phones, all with similar specs, that got lost in the shuffle. There was no standout, which can make things difficult for consumers. If Windows Phone enthusiasts debate the “best” Windows Phone, then how is a consumer expected to know which is the clear winner. While having standardization of specs is advantageous to consumers, it also makes it tougher to differentiate models. Branding matters and it can help sell phones. It’s still very early, but is this year shaping up to be a repeat of last? Mango brings Windows Phone to forefront again this fall, but Microsoft is again relying on the marketing savvy of manufacturers and wireless carriers to make Windows Phone a success. A great product alone is sometimes not enough. With Apple, you have one choice if you want the latest and greatest. Right now, that’s an iPhone 4 and next month it will be the iPhone 5. The iPhone 5 will benefit from massive campaigns from Apple, Verizon, AT&T and possibly even Sprint. If you look at the Android landscape, there is a new phone almost daily. There is a great level of differentiation based on specs, features and even the version of OS. Just yesterday, AT&T announced the Infuse 4G (not to be confused with the Inspire 4G) running Froyo, when Gingerbread has been out for quite some time. With all the various devices, it’s no walk in the park to select a new Android phone. Marketing matters and it’s apparent with Verizon’s successful Droid campaign, which includes phones from a variety of manufacturers. For Microsoft to acheive similar success, they might need a similar marketing success story and might be dependant upon the wireless carriers to make that happen. Microsoft’s ‘Glance and Go’ campaign was great, but they cannot be responsible for picking winners. The brief clip of the Focus at the end doesn’t count. Compare that to the Droid Bionic commercial and which one is more captivating? You cannot pick a favorite child, it doesn’t work that way. You could put all of the various Android phones on a table similar to the one Ballmer stood over in 2010 and have the same issue. How does a consumer pick a winner? The exact same way they do it with Android phones. Successful marketing. If you look at the field of competition this fall, you’ve got iPhone and Android. There are various big devices coming this fall from Android device manufacturers. You can expect marketing dollars to get behind Droid and Nexus brands. On the Windows Phone front, HTC has already introduced the HTC Radar and HTC Titan. It’s not clear if these will or will not carry the same branding when they hit the shelves of wireless carriers in the US. We’re waiting on Samsung and LG to provide announcements related to their upcoming devices. If at the end of this, the result is a table filled with non-descript phones, it could be a repeat of 2010/2011. Somewhere along the line, the carriers need to pick a winner and get behind it. HTC, Samsung and LG all play both sides, but will they allocate the marketing dollars to Windows Phone? How about the carriers? Can Microsoft give them a nudge? For all it’s faults, the KIN had more brand recognition then the current crop of Windows Phones. Things need to change. Otherwise, consumers will find themselves shopping Droid Bionic, Nexus Prime, iPhone and those other phones running Windows Phone Mango. That’s not how you win. Motorola is doing terrible in the phone business. Their market share is falling fast and they lost $65 million last quarter alone. The company had to be sold or it would be near death. MMI does not have much market share which is one reason Android OEMs have cited they were not threatened by the Google merger. Android is successful because of the low end phones and the breadth of selection and carrier availability. Windows Phone has none of these things. Lately tons of advertising hasn’t Helped Motorola’s products sell. Wrong, wrong, and wrong. First off, the bane of Android’s existence is precisely the fact that you’ve got such HUGE fragmentation that it almost exactly mirrors the primary issue that plagued PocketPC and Windows Mobile. It’s only because Android devices are the whores of the smartphone realm that it succeeds. Who cares about the failings if you DO have a new device coming out daily? I mean, seriously. I’d argue that there’s not nearly as much differentiation in the specs as you think. Volume of device models doesn’t necessarily mean they are all that different. All you really are talking about is a higher degree of granularity in the spectrum from “minimal” model to “uber” models. With iPhone you have zero differentiation. Windows Phone takes an approach in between those two. Also, why on earth does it matter if you have a “clear winner” in the Windows Phone platform? You don’t have one in the Android platform, I can promise you that. There are as many favorites as there are models. I contend that the smarter approach IS, in fact, less granularity in variety but enough that give people the bigger areas of choice. Keyboard vs no keyboard, for example. Limitations up to this point centered around what APIs were available to OEMs. That’s still the case with Mango, but those limitations are not much different than those existing with either Android or iOS. The only glaring difference I’d say is the whole SD card situation. I completely agree with Microsoft’s approach to the implementation of SD cards in the devices that actually support them (I have the Focus for specifically that reason), and think it’s a shame that with Mango this hasn’t been more fully exploited. Because file management is so very different, it makes sense that a completely removable card isn’t supported—we should be using the cloud anyway. It’s an old, tired meme that people are still holding onto by insisting on sneaker-netting files on a card. GET OVER IT, people. But, having sufficient storage on the phone itself for cases when you DON’T have access to the cloud IS an ongoing issue—at least until infrastructure, technology and price TRULY make cloud access universal and consistent. With the release of Mango there are three things that I believe threaten future success. Still-weak enterprise support (e.g., encryption, etc.) is one. Marketing is another BIG one. Carriers, specifically the salespeople, who are completely clueless about WP7 and how it’s different from the other platforms, is that last one. I’ve consistently gone into AT&T stores and easily reduced the salespeople to puddles of whimpering goo because there were to stupid to be able to speak intelligently about WP7 in comparison to other platforms. In contrast, I’ve been to a Best Buy where the salesperson accurately described the strengths–and weaknesses–of WP7 to a person who was looking to graduate from a feature phone. I suspect HTC is about to make the hardest push to boost recognition. If they do it right, that could be the shot in the arm that’s needed. My concern with the approach is based upon what I’ve seen in terms of the marketing of Windows Phone, from a device perspective. Microsoft’s campaign was excellent, but the device campaigns were poor at best. What you see at the store level is in great part due to the inability of the marketing message to drive widespread adoption. If we count on wireless reps, they won’t push an unknown commodity. They know Android, they know iPhone. Android’s success is large in part to a. being the antithesis of iPhone and b. success of first Verizon Droid campaign. Will the HTC Titan, Samsung Focus S or Samsung Focus Flash be able to match up with the marketing of the Nexus Prime or iPhone 5? Today’s extremely quiet press release announcement doesn’t paint a very good picture. Carrier marketing dollars are needed, even if Microsoft somehow subsidizes them. The platform needs a hero device. Poor marketing? I’ve seen loads of adverts for WP7, in Cinema, TV, and constantly on the xbox 360 dashboard. Thats not the problem. People have been detailing the problem for ages. SHOPS. Try finding a WP7 in a shop. Once you find the dingy corner its hidden in, try finding a demo model, or a salesman who’ll actually tell you anything useful about it. Even the pictures of a couple of Phones that every shop always has, always has an iPhone, an Andriod, and a Blackberry. They never show a WP7. I know Microsoft is starting to fly phone shop staff in for training, and thats certainly a very good step. Pay the shops to add WP7 to all their generic advertising. Give some shop staff free WP7s, so they know what they are selling. It’ll all help. In store experience is also a big problem. There has been advertising, but it’s not device specific. The Samsung Focus ads weren’t very memorable. What is wrong with wanting to store my pictures, music, and data on my own removeable card and NOT use the “cloud”? Sorry, but I don’t like the idea of putting my data in somebody else’s hands when I don’t need to. Add to that the issue of data transfer and my data usage will jump if every time I take a photo, or try to view it, I have to use the network. Playing my music would mean I am streaming from the “cloud”. All this will cause an increased load on the provider’s networks – maybe THAT is a problem the carriers aren’t capable of handling. There are too many places that I can’t get good mobile service, but still want the other features of my phone. If MS makes me carry additional devices for music and photos, I will switch.